Join us on Saturday, March 16, from 1-6 pm for an Open House at DWRI Letterpress! Come see what we have been up to in the shop, meet our Italian printer friends from Betterpress Lab, Roma, browse new prints, cards, and artwork, and celebrate spring and the world champion Boston Red Sox, with handmade baseball goods from Huntington BBC, all while sipping on coffee from Bolt Coffee Co.! One again, we are opening the doors to the shop for a holiday sale on Saturday, December 1st, from 10am to 4pm! Stop by to see new prints, cards, calendars, blank books, and the all new, Joan Wood inspired Baseball Scorebooks! All happening a 40 Rice Street, in Providence! NEW WORK by Dan Wood and Lois Harada from DWRI Letterpress in FRESH PRINTS. Opening at the AS220 Project Space on August 5 from 5 to 7pm and on view till August 26, 2017. Join us Saturday, September 24th from 3-6 pm at 260 Westminster Street in Providence! Grant's Block will be converted into an outdoor lounge by Greycork, with tunes by DJ Analog Underground, a pop-up Print shop w/ DWRI Letterpress (sponsored by Craftland), and plenty of craft-oriented vendors from the Providence Flea so you can see the latest in Providence's creative exploits. Grab yourself a cocktail and mingle with some of the best minds in design! Join DWRI Letterpress at the Newport Folk Festival and RISD Craft! More info to come on where we'll be located at each event. We're working on new art prints, cards and stationery so come visit us outside of the shop. 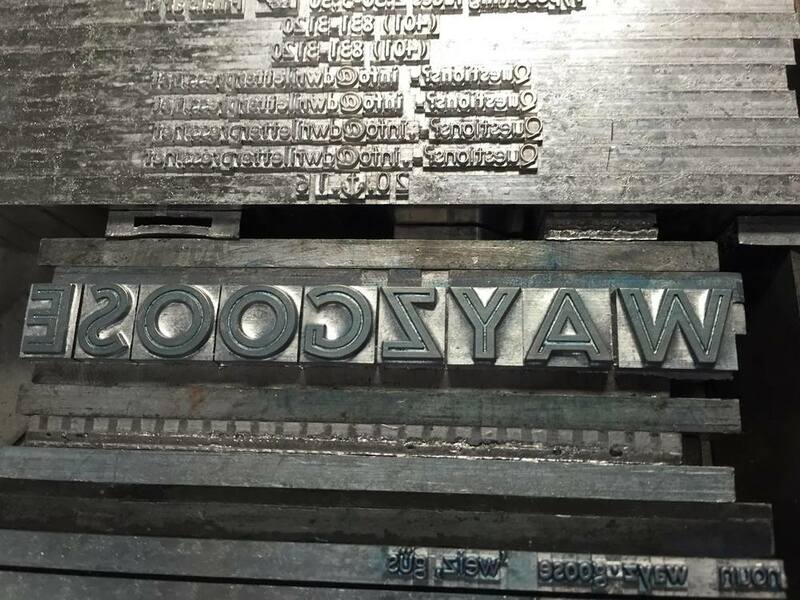 Join us for the DWRI Letterpress 2016 WAYZGOOSE! Tour the shop, see what projects we've been working on and shop our new series of editioned prints and stationery. We're also hosting type setting races and will be running printing demonstrations throughout the day. DWRI Letterpress is teaming up with The Dean Hotel on Friday, December 4 from 4 to 9 pm! We'll be on the top floor of the hotel in a suite of rooms called 'The Heights' showing off our latest printing projects, goods for sale, and running a printing demonstration. Join us to shop, chat about future projects, or snag one of our new lapel pins. Little Bitte Artisanal Catering will be joining us to sell cocktail gift baskets which pair with our coaster set collaboration. You can pick up either the Exotic Cocktail or Classic Cocktail Variation sets which feature recipes crafted by Little Bitte.